This treat actually came about through circumstance and accident. Over the weekend I met an old friend for brunch and stopped into a large gourmet market near the restaurant on my way home. I'd already noticed that the local fruit vendors had figs for sale but they were too soft and wilted. This market, however, had firm and perfectly ripe figs for sale and I couldn't resist buying them. But now that I had them, I wasn't sure what to do with them. The next day I received my grocery order from our local online delivery service and they accidentally included a full fat Greek yogurt instead of the low fat I normally order. I've been meaning to try yogurt in a cake for a long time but hadn't gotten to it yet. So maybe having the full fat stuff was a sign I should finally bake a yogurt cake. The question of what kind of cake answered itself pretty quickly with a glance at the fresh figs and this became a very delicious accident and circumstance. And my verdict on baking with yogurt? Moist, tender...I may never bake without it ever again. Enjoy! Using either a stand or hand mixer, add the eggs and sugar to a large bowl and beat together until fully combined. Beat in the butter, vanilla, lemon zest and yogurt. In a separate bowl, sift together the flour, salt, baking powder, ginger and cinnamon. Slowly stir the dry ingredients into the wet until all the flour is incorporated. Butter and flour a loaf pan (add parchment paper for easy removal) and pour in the batter. Place the quartered figs along the top of the batter and press in slightly until only the tops are showing. Bake in a pre-heated 350 degree oven for approximately 50 minutes or until a toothpick comes out clean. Dust with powdered sugar before serving. Makes 10 servings. Beautiful and delicious? 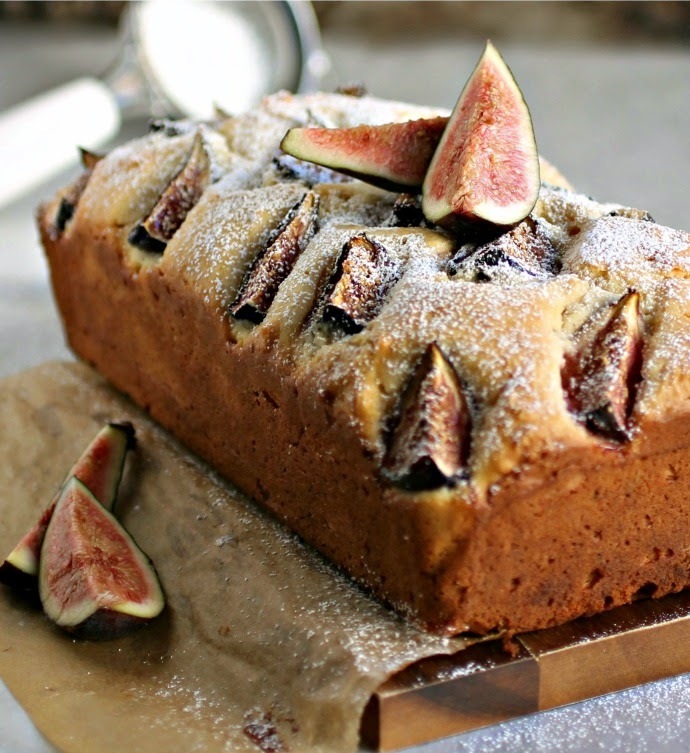 I've got to try it, my husband loves figs! 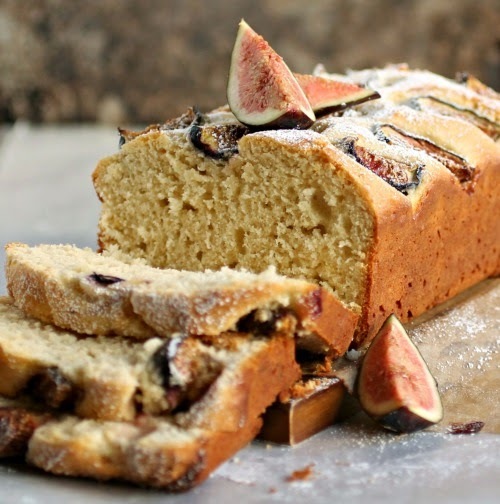 Between the fresh figs and the mistake with the full fat yogurt, this cake was meant to be! It's gorgeous, Anita. 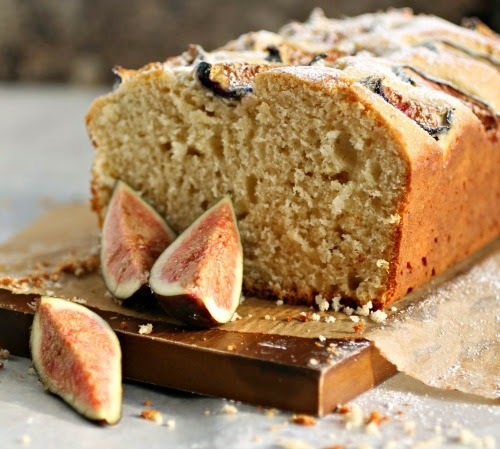 I love that you merely studded the top with the figs so as not to make the inside too wet, and the texture of the loaf is perfect! I LOVE this! This cake is just gorgeous, Anita! Gorgeous and amazing cake Anita. What a great happy accident to make it happen. this looks like a great little cake. love the idea of using yogurt, and i've always thought fresh figs were quite beautiful. great photography, too. pinned! It looks beautiful, was moist and tender, and yet strangely had no flavor at all - all my grocery stocks is 0% fat Greek yogurt. Whatever you do, use full fat yogurt.